History shows that e-boats are nothing new, but solar drive systems are an interesting development. Onboard solar generators allow independence from the plug socket. Emission-free drive systems not only of protect the environment, but they increase the quality of the boating experience - for example, in protected areas it is possible to approach water birds very closely. Solar boats are electrical boats, with independent, quiet and clean engines, whose batteries store free energy from the sun. 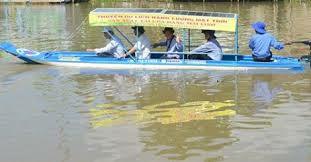 Four Vietnamese farmers have invented a solar-powered boat in Dong Thap Province in the Mekong Delta of Vietnam that will be rolled out across their province. The boat can travel at speeds of 20kph silently and produces no pollution with a solar-powered battery that lasts for three hours, according to Toui Tre News. It requires two panels to receive solar power, two batteries that store the solar energy, an engine with five forward gears and two reverse gears. The farmers, Huynh Thien Liem, Nguyen Van Dung, Huynh Van Trang, and Thai Van Hoang, built the boat without any technical blueprint in a field and then tested it on local rivers. It proved so successful that state officials paid a visit and were so impressed that they have now put down a large order for similar boats to be used for tourists at the Tram Chim National Park in Dong Thap Province. Although solar powered boats do exist, they are mostly built by boating enthusiasts.